The last time I posted about SaladBox was years ago, so writing this is almost like taking a step back in time again. It's also been too long since I reviewed a subscription box of any kind. I have good reason now to though because SaladBox and I have officially partnered up and every month, I'll be reviewing one of their boxes. This is a little overdue, but I'll be talking about what's in their April box. To be fair, I did receive the box mid-May. Haha. 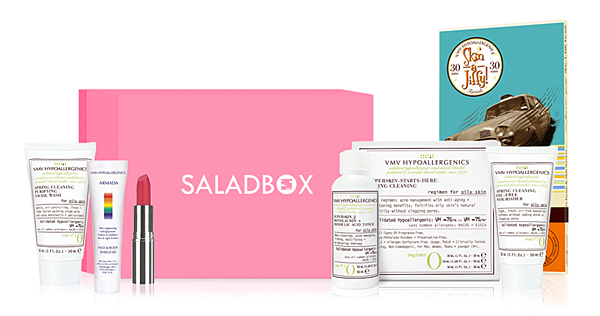 Like many other subscription boxes, SaladBox often collaborates with different beauty brands. For this month, they teamed up with VMV Hypoallergenics - the top makeup brand for sensitive skin! I've heard a lot about VMV and some even swear by their products, but I never got the chance to try them out for myself. Since I've become more open about testing 'gentler', more natural products I was very much keen to see what this box had in store. Are you as well? This month, we’re patterning with classic Filipino global brand VMV Hypoallergenics in curating your for April. We will give you a “fresh take” on beauty through these skincare and makeup products from one of the country’s biggest beauty brands. PLUS, we included a gift certificate that can be redeemed for a facial service which will leave you feeling fresh, guaranteed. Here are the three, specially chosen products! 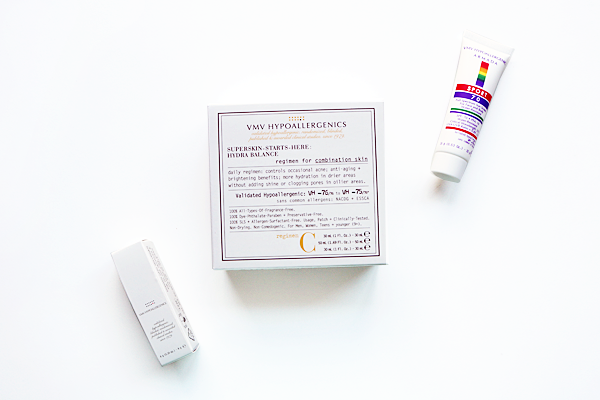 For the month of April, SB subscribers received the VMV Hypoallergenics Armada Sport Sunscreen (sample size) VMV Hypoallergenics Superskin-Starts-Here set, and a full size VMV Hypoallergenics lipstick. Not pictured but also included is a VMV Hypoallergenics Skin-a-Jiffy facial gift certificate worth Php750.00 that can be used at any VMV Hypoallergenics branch. 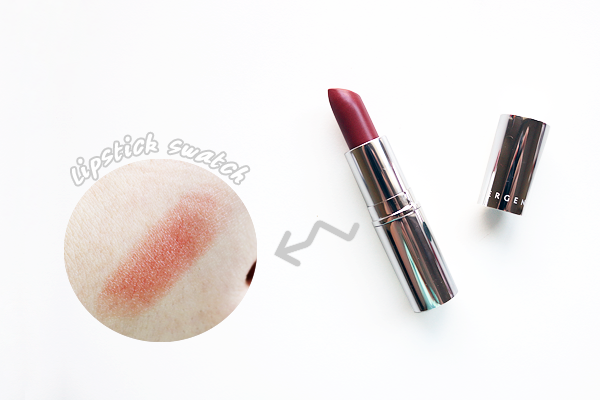 The VMV Hypoallergenics lipstick (Php1,075.00) is actually a sheer lip tint and you can see from my swatch that it is indeed pretty sheer. This is a good pick if you're not really a lipstick kind of gal like I am, especially lipsticks of the red variety, and just want a hint of color on your lips to make them look hydrated and healthy while also making you look extra primped and polished. The VMV Hypoallergenics Armada Sport Sunscreen (Php500.00) is something I've been hearing a lot of good things about. VMV claims it provides 'intense protection against skin cancer, hyperpigmentations, and photoaging' and has an SPF of 70. Great news for someone like me who burns really easily! 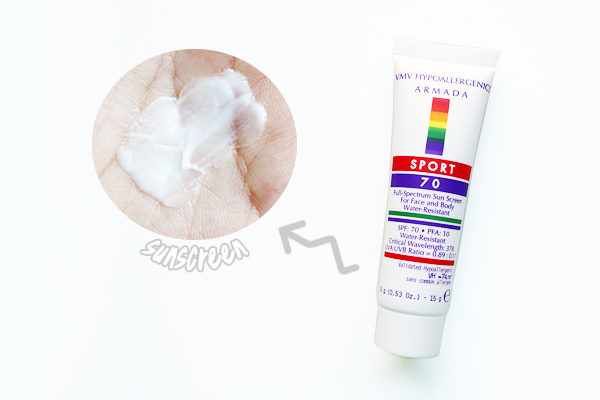 Aside from that it's also water-resistant, as its made for 'active use' like when playing sports, hence the name, and is a full spectrum kind of sunscreen. I really like this particular sunscreen because first of, it doesn't leave you feeling greasy like most other sunscreens. Sure, your skin is a little sticky or tacky after application, but it lessens as the product 'settles' onto skin. I actually like that it's a little tacky because I believe it helps my makeup cling on better if I use this prior to putting on my base makeup. Though it is supposed to be fragrance-free, I find it has this faint, but definitely more pleasant scent compared to your traditional sunscreen and truly is light-weight like it promises. Other good tidbits is that it claims to be 'pore-friendly' and non-comedogenic too. A lot of sunscreens cause me to break out when I use them on my face, but so far this one hasn't given me the same, negative effect. I like this sunscreen so much that I actually can't wait to use up this entire, mini bottle so I that I can grab myself a full-size one soon! 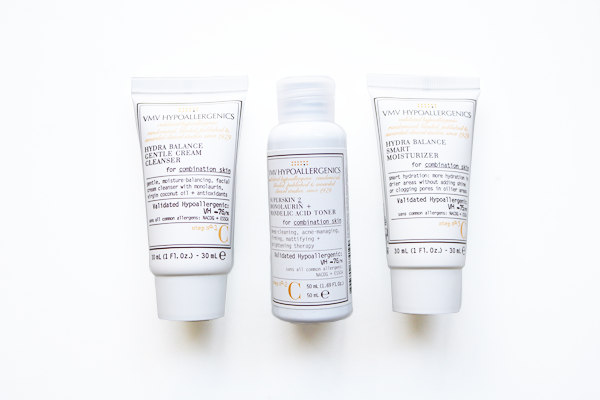 Last but not least is the VMV Hypoallergenics Superskin-Starts-Here set (Php1,245.00) which comes with a cleanser, toner, and moisturizer. The set is a daily regimen for combination skin that is supposed to control 'occasional acne', provide hydration to the drier areas of the face without adding shine or clogging pores, and has both anti-aging and brightening benefits. Of course it's also supposed to be fragrance and preservative-free, non-comedogenic, and is suitable for men, women, teens, or even those younger aged 9+. I have dull, combination skin that leans towards the drier side of the spectrum and also sometimes suffers from minor breakouts so this set sounds perfect for me. Plus, since I'm nearly 30, I'm all about anti-aging benefits! The toner, I found, is actually a mandelic acid toner. In other words, an AHA (alpha hydroxy acid). Ever since I started regularly incorporating AHA into my skin care routine (specifically by using Maxipeel's Skin Purifier), I've been breaking out signficantly less and my skin is much smoother and less prone to hyperpigmentation from acne. Mandelic acid is great for treating the likes of hyperpigmentation and it has anti-bacterial properties making it a wise choice for skin that's acne-prone. I haven't had the chance to try out the entire set yet but I do plan to dedicate an entire post to it once I've been using it for at least a few weeks so watch out for my review on that! April's SaladBox was worth a total value of Php3,500 but if you're a subscriber, it was only the regular, SB monthly price of Php500. Isn't that a steal? 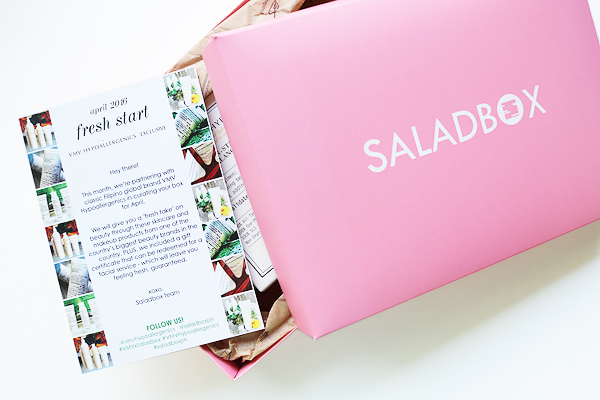 SaladBox also introduced a new feature in March called SaladBox Sample Select where you can choose one of the samples that will be included in your box of the month. For April, it was the lipstick's shade and finish. As this was just given to me, I didn't get to choose but I do like what was chosen for me, as well as all the products for this month's box, and I already can't wait to receive my next one soon! SaladBox subscriptions available are Starter Plus Plan (3-month prepaid subscription), Six-Month Prepaid Plan, and One-Year Prepaid Plan. Head on over to saladbox.com.ph to register for an account and choose your plan!